With Angie and Tate's wedding just around the corner, it's a happy time for Melanie Cooper and the bakery crew. Not only are they finessing the last minute details of the big day, but their bakery, Fairy Tale Cupcakes, has just been hired to bake cupcakes for the blockbuster book signing of a controversial author who wrote a steamy bestseller filled with juicy local gossip. But one by one, the people Angie has hired to work at the wedding begin turning up dead. As the body count rises, the bestselling author is the next to bite the dust. Mel quickly realizes she needs to figure out how the murders are connected and why--before the killer brings the entire cupcake crew crumbling down. After all, Angie and Tate deserve their sweet happily ever after. 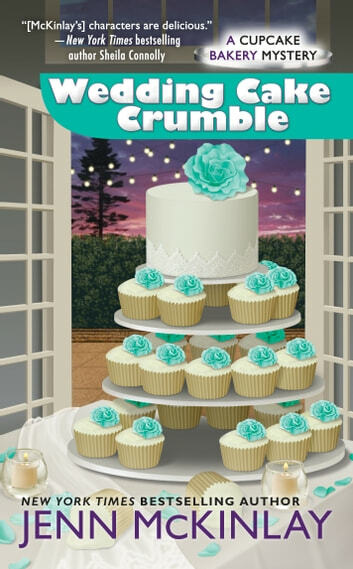 Another great mystery from the Cupcake Bakery Mystery series! As preparations gear up for Angie's wedding, Mel finds herself in the midst of dead bodies once again. The plot is multi-layered as the mystery is unwound and the personal lives of the characters once again becomes intertwined. Excellent plot with superb characters keep you entertained and engaged with the story! It is one week until Angie and Tate’s wedding, and Mel, as maid of honor, has joined Angie in running errands to various venders to make payments. A stop at the photographer turns up a nasty surprise – his dead body in his office. Mel’s Uncle Stan, a homicide detective, quickly makes a connection to another murder, that of Angie and Tate’s limo driver. Is someone out to sabotage the wedding? Will any of them be the next target? This book is a pure delight for fans. The wedding does take over a bit in the second half, but I didn’t mind in the slightest. We’ve been waiting a lot of books for this moment. And that’s not to say we don’t get a good mystery with some interesting twists. The new characters are good, but the series regulars shine with their own sub-plots. This book also has some great laughs. Tenth book in A Cupcake Bakery Series! 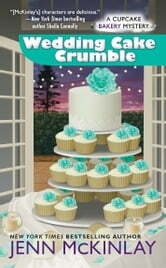 Wedding Cake Crumble by Jenn McKinlay is the tenth book in A Cupcake Bakery Mystery series. Angie DeLaura is marrying Tate Harper in just one week. Angie and Mel have left Fairy Tale Cupcakes in the capable hands of Oz and Marty while they head out to issue payment to wedding vendors. After visiting the florist, they head to Blaise Ione’s studio, the wedding photographer and old friend of Tate’s. They find Blaise sitting at his desk with a camera strap twisted about his neck. Later that day, they discover that the driver Angie hired was found bludgeoned to death. Is someone trying to sabotage Angie and Tate’s wedding? To keep their minds and hands occupied, they agree to provide five hundred cupcakes for a book signing Cassie Leighton of A Likely Story is hosting the next day. The event is for the release of Elise Penworthy’s The Palms which has many people up in arms. It turns out that Cassie needed a new baker because the one she hired had been murdered. It seems that Cassie had hired the same photographer and driver for Elise that Angie was using for the wedding. Mel and Angie rush off to find Elise, but they are too late. Elise has been stabbed in the back with her own pen (ouch). Cassie ends up arrested. Angie and Mel know she did not kill anyone and set out to find the guilty party. The suspect list for those who disliked Elise is quite lengthy thanks to her book. Can the cupcake ladies find the killer before the wedding march begins? Wedding Cake Crumble is not a standalone novel. You need to read the other books in the series prior to picking up Wedding Cake Crumble. I thought the book was well-written and had a nice, steady pace. Jenn McKinlay has a writing style that draws the reader in and keeps their attention. The characters are well-developed and relatable. There is a nice mix of personalities and Angie’s brothers will have you in stitches. Marty is a unique character that has issues with his daughters and his girlfriend, Olivia Puckett. I was happy to see him stand up for himself (finally). Oz has come such a long way. From the descriptions provided, the cupcake tower he made for the wedding was beautiful (the color scheme for the wedding was aqua and pewter). My favorite character was Peanut, Elise Penworthy’s puppy (he stole the show). His hijinks will have you laughing out loud. Peanut and Captain Jack are adorable together. The mystery was not complicated (unfortunately). Identifying the guilty party was child’s play. I thought it was clever how the author managed to work in a mention of an incident from the of A Hat Shop Mystery series. There are plenty of cozy moments in Wedding Cake Crumble with the family and friends coming together for Angie and Tate’s wedding. I am looking forward to Joe and Mel’s upcoming nuptials now that they have set a date. I am giving Wedding Cake Crumble 4 out of 5 stars (I liked it). Jenn McKinlay has provided readers with an entertaining cozy mystery that they will delight in devouring as quickly as possible.